The transition from a liquid based diet to semi solids can be confusing and difficult for your baby. Mee Mee's Squeezy Silicone Spoon Feeder is the perfect combination of the advantages of bottle feeding and spoon feeding making the transition easier for your baby and for you. 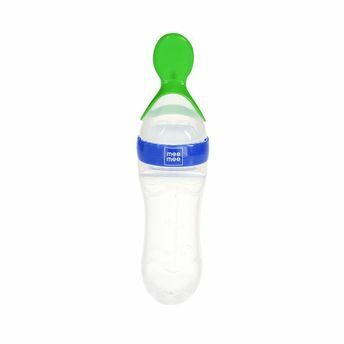 It holds the baby food eliminating the need for the jar, packs the food into a single utensil and with one squeeze you get easy one-hand feeding! The feeder is to be cleaned and sterilized before and after every feed. You can clean all the parts of the feeder using warm water and Mee Mee Liquid Cleanser. Wipe them with a soft dry cloth. Make sure that all the parts are completely dry before you put the food into the feeder. Store it in a clean and dry place.